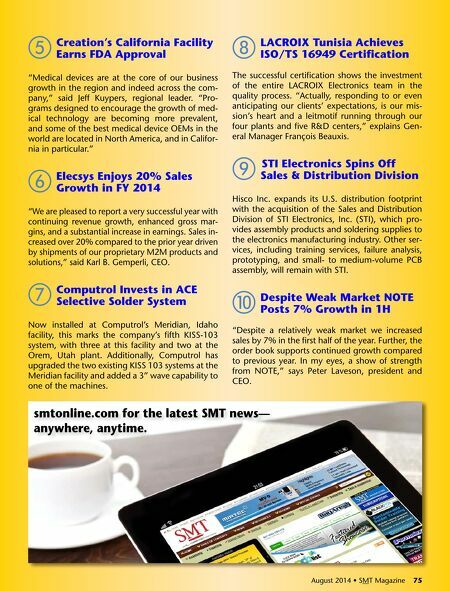 August 2014 • SMT Magazine 75 e Creation's California Facility Earns FDa approval "Medical devices are at the core of our business growth in the region and indeed across the com- pany," said Jeff Kuypers, regional leader. "Pro- grams designed to encourage the growth of med- ical technology are becoming more prevalent, and some of the best medical device oEMs in the world are located in North america, and in Califor- nia in particular." f Elecsys Enjoys 20% sales growth in Fy 2014 "We are pleased to report a very successful year with continuing revenue growth, enhanced gross mar- gins, and a substantial increase in earnings. Sales in- creased over 20% compared to the prior year driven by shipments of our proprietary M2M products and solutions," said Karl b. gemperli, CEo. g Computrol Invests in aCE selective solder system Now installed at Computrol's Meridian, Idaho facility, this marks the company's fifth KiSS-103 system, with three at this facility and two at the orem, utah plant. additionally, Computrol has upgraded the two existing KiSS 103 systems at the Meridian facility and added a 3" wave capability to one of the machines. h LaCROIX tunisia achieves IsO/ts 16949 Certification The successful certification shows the investment of the entire laCRoIx Electronics team in the quality process. "actually, responding to or even anticipating our clients' expectations, is our mis- sion's heart and a leitmotif running through our four plants and five r&D centers," explains gen- eral Manager François beauxis. i stI Electronics spins Off sales & Distribution Division Hisco inc. expands its u.S. distribution footprint with the acquisition of the Sales and Distribution Division of STi electronics, inc. (STi), which pro- vides assembly products and soldering supplies to the electronics manufacturing industry. other ser- vices, including training services, failure analysis, prototyping, and small- to medium-volume pCb assembly, will remain with STi. j Despite Weak Market NOtE Posts 7% growth in 1h "Despite a relatively weak market we increased sales by 7% in the first half of the year. Further, the order book supports continued growth compared to previous year. In my eyes, a show of strength from NoTE," says Peter laveson, president and CEo. 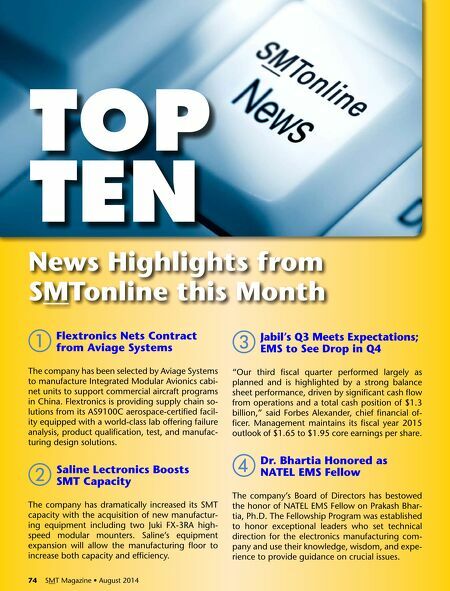 August 2014 • SMT Magazine 75 smtonline.com for the latest sMt news— anywhere, anytime.